Wanna buy a sick nanganator online? Get one for just $37 here. Nang is a slang name for the small metal cylinders usually used in whipped cream siphons. They are also called nossies or whippets. The cylinders have about eight grams of nitrous oxide in them that can be inhaled for a euphoric effect. The 2016 global drug survey found nitrous oxide is the seventh most popular drug in the world excluding alcohol, tobacco and caffeine. Nang use seems to be increasing in Australia. An annual national survey of people who use ecstasy found a significant increase in the number of people also reporting recent nitrous oxide use from 26% of people surveyed in 2015 to 36% in 2016. But not much is known about how widespread nang use is. 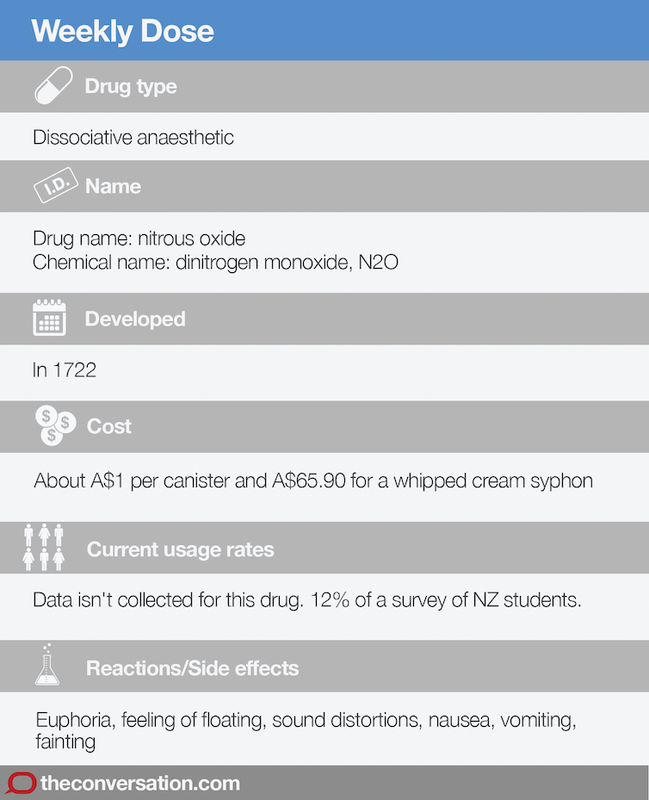 The Australian household drug survey does not report nitrous oxide use specifically and does not list it in the range of pharmaceutical drugs or inhalants. A 2013 survey of 1,360 university students in New Zealand found 12% of the sample reported using nangs in the past year. The average number of bulbs used in one session ranged from two to six. Nangs are cheap, legal and easy to get. A box of ten costs less than A$10 and they are stocked in supermarkets and service stations. To use them, the cylinder is pierced and the gas released into a balloon, then inhaled. A balloon is used because the gas is freezing and can burn the face and lips. It takes about one minute to feel an effect that lasts about one minute. Nitrous oxide is a colourless gas used for pain relief in hospitals and dentistry. It’s a dissociative anaesthetic. This means that at low doses, it gives a sense of floating and separation from the body without causing unconsciousness. The positive effects of nangs are reported as euphoria, a feeling of floating and heightened consciousness. The negative effects include nausea, vomiting, disorientation and lack of oxygen to the brain. Some people make strange sounds and movements while intoxicated. Heavy users may get a vitamin B12 deficiency, because nitrous oxide inactivates B12 in the body. The symptoms include numbness and tingling in toes and fingers. Difficulty walking may happen in serious cases, that lasts until B12 levels are increased. Some regular users have reported memory loss and trouble concentrating. Seizures and collapse have also been reported, but usually when nangs are used in combination with other drugs. Nitrous oxide was synthesised by an English chemist, Joseph Priestly, in 1722 and used as a recreational drug at laughing gas parties. It wasn’t used as an aid to surgery until 1844. Manufacturers started using nitrous oxide for whipping cream and making aerosols in 1869 and to increase engine performance in cars. An explosion in a Florida factory where nitrous oxide was made has reduced supplies in the USA, including in whipped cream products. The word “nang” as a name for small nitrous oxide cylinders appears to be Australian. It’s thought to come from Western Australia, and mimics the sound distortion people hear while intoxicated. Nang is also a British slang word for excellent or awesome. Seventeen deaths in six years in the UK were reportedly caused by nitrous oxide, while the USA reports about 15 deaths per year. Australia has not reported any. The long-term health risks associated with nitrous oxide use include B12 deficiency, brain damage from reduced oxygen, incontinence, depression and psychological dependence. However, there are few reports of people using nangs for long periods of time. Nang use may be overlooked as a health risk because most people using them are likely to use other drugs as well. It’s also important to note that nitrous oxide is linked to climate change, so there are environmental risks too. This gas is about 300 times more damaging than carbon dioxide to the atmosphere.